“I love to create magic—to put something together that’s so unusual, so unexpected that it blows people’s heads off. Something ahead of the times.” (Michael Jackson to Interview Magazine, October 1982). As you walk down the aisle at a record store, you spot a copy of Michael Jackson’s Bad. What strikes you about it? It seems, well, bad. The title itself is spray-painted on a wall, tag-style. The artist isn’t the same Michael from just one album before, Thriller. That smiling Michael wore a suit and presented himself as a passive object for us to love, and love him we did. Here, there is no welcoming smile, no passive, romantic man lying prone for us to take advantage of. This Michael is in black leather with straps and buckles and studs. This Michael is also paler, and the paleness is accentuated by the contrasting black outfit and the much longer, looser dark hair. Since Thriller had become the number one selling album of all time, he knew he had a captive audience. So what did he do with it, and why did he change himself? 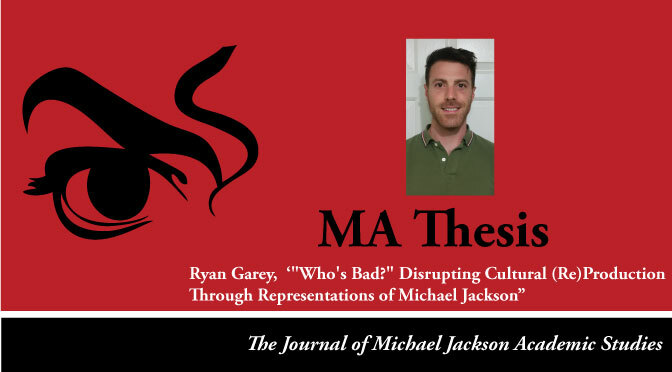 This thesis walks through the Bad album track by track (with one deviation from the album’s organization), drawing attention to the intersecting, conflicting messages it creates about culture, about relationships, and about Michael himself. I am indebted to Susan Fast and her contribution to the 33 1/3 series, Dangerous, as a springboard for my thinking, as well as organizational and methodological concerns. My focus is on the importance of Bad as an influential cultural artifact. Though Michael Jackson evolved throughout his career, the biggest changes or seeds of changes were sown in Bad. Later albums were overtly political (as Fast’s Dangerous explains) but also much less commercially successful. In many ways, Bad serves as a culture-shaping artifact precisely because it was still commercially viable. And this project will show how commercially successful “pop” art has the most culture-shaping potential of any art. Bad was a turning point in Jackson’s career in many ways. To set the stage for my analysis, I want to discuss briefly some of the events and changes leading up to the Bad album that make it particularly interesting to study and particularly important for the development of Jackson’s career and for cultural change in general. Before Bad, Jackson worked with an array of writers on every song, and he continued to collaborate for the rest of his career. But for the first time in his career, Jackson wrote and co-produced most of the songs on this album. Many people glance over this point: it is a popular myth that Michael Jackson wrote all of his own music. While this can be considered true in some very specific and important ways (which I will address in Chapter 4), it must be acknowledged that there were always multiple agents behind the creation of each song and artifact stamped with the Michael Jackson brand name. “Thriller,” perhaps the most famous of the songs in Jackson’s discography, was written by a man named Rod Temperton. But of the tracks on Bad, only two were not written by Jackson. They are of course still Michael Jackson songs even though he didn’t “write” them, per se; but perhaps more importantly, the inverse is also true: the artefacts, the songs, the messages that consumers receive and perceive as “Michael Jackson” aren’t necessarily products of a full, non-contingent agency on the part of the man who bears the name. The balance between Jackson-authored and other-authored songs switches decisively on Bad, which complicates and enriches what the album does for Jackson’s career and for popular music in general. It is notable that the Bad tour was Jackson’s first without the supporting cast of his siblings (Bush). Though he had already released a few solo albums, touring without his family allowed the “individual artist” mystique to fully set in. It seems to send the message, like writing and (co-)producing most of his own songs, that this is his music, his doing, his message, whether or not this was “actually” and completely the case. During the Bad tour, Jackson struck a partnership with Michael Bush and Dennis Tompkins, the duo who would design his clothing for the bulk of the remainder of his career. While his outfits for the Thriller tour and videos were iconoclastic, the Bad wardrobe (and all the outfits beyond) transcended to the level of spectacle. Commencing with this partnership, his clothing and body started to make him more than just a strange or exceptional human; they made him increasingly super-human. The evolution of dance moves on the videos connected to Bad took Jackson’s dance from entertaining to spectacular. Though he had incorporated the moonwalk into his “Billie Jean” routine on the Thriller tour, he honed and perfected it in the Bad videos. Through developments in his dancing and clothing, Jackson began to push the boundaries of what bodies could and should do, and what they could and should look like. During the 5-year gap between the release of Thriller (November 1982) and Bad (August 1987), Jackson’s physical body also changed dramatically. In 1984, he was filming a commercial for Pepsi when mistimed pyrotechnics lit his hair on fire and he suffered second- and third-degree burns on his face and head. This prompted his first significant plastic surgery. Media, fans, and critics have been quick to categorize Jackson’s bodily transformations as products of a deranged mind, an abusive past, or symptoms of general creepiness. The Pepsi incident was likely not the sole impetus for Jackson’s surgeries (he also had a skin condition called vitiligo, which causes blotchy light patches on the skin). But despite legitimate medical reasons for the changes, Michael Jackson’s changing body prompted a multitude of stories, and thus became an increasingly important battleground about what was culturally appropriate for bodies: some people prefer the earlier Jackson who looked more like a young black man, while others prefer the later Jackson whose body had an increasingly ambiguous gender and whose lyrics and dance moves broke open assumptions about the gender binary. There are many factors influencing the changes in his appearance, but the fabricated stories about these changes had real-world effects and thus became effectively real. This project is not about “setting the record straight,” finding out the “truth,” or separating out the “authentic” Michael Jackson from the constructed one. My point, rather, is to show how Jackson embraced ambiguity about himself, his background, the stories people told, his skin color, his gender, his sexuality. He relished the uncertainty and discomfort because it made people ask hard questions about their assumptions. Essentially, the Bad album was the beginning of Jackson’s turbulent relationship with the tabloid media, but this caused a fruitful proliferation of meanings about himself, his appearance, and his body, and that proliferation of meanings disseminated through his music to a vast audience. Now that I have given some important context for the album, I will now delimit my theoretical approach for analyzing it. I give a brief review of cultural criticism surrounding the problematic of hegemony and popular culture. After describing various theorists’ attempts and failures to resolve the problem through subcultural subversions, I will highlight a key weakness in their theories from which I can theorize some possibilities for counter-hegemonic action, and I will situate Michael Jackson and the Bad album within this context. Through consumption of mass produced media (which I equate with popular culture artifacts), the individual becomes an object whose value lies in following the norms of behavior laid out through popular culture. Though the authors are talking about popular films, this theory can extend to other media. Popular culture, they claim, robs people of thought and molds them into copies of what is portrayed on the screen, in the song (126-127, 145). Pop culture produces a (false) reality “as nature,” which then gets appropriated by the masses and becomes a generalized, material reality, or a standard against which to measure reality (129). None of this seems problematic to the consumer because of the pleasure involved in consumption – pleasure which actually promotes accepting this new reality (Storey Reader 142). Adorno discusses how this works in music in more specific terms. He says that standardization in music leads to standardized reactions (Adorno 77). Pop music does the listening for us, and the pseudo-individualization of the details (which are all substitutable and not structurally unique) makes us forget or forgive the standardization (Adorno 79). The end result of consuming mass-produced culture is that we become mere approximations of the model we are given (Storey Reader 167): we are not “ourselves” but a combination of tropes we are continually fed by the culture industry. This educative function of popular culture is a problem for Marxists because of the implications for the dominant and subordinate classes (in popular culture theories, these often get labeled as producers and consumers). If Horkheimer’s and Adorno’s ideas about pop culture are true, then the ruling class could simply pump its ideology into entertainment of all sorts and feed it to the workers, who would then learn to accept the conditions of their own oppression. This problematic was well-theorized as hegemony by Antonio Gramsci. According to Gramsci, and later Althusser, the ruling class uses institutions like schools, churches, and, foremost here, the music industry as Ideological State Apparatuses (ISAs), who organize society in specific ways and promote specific values, beliefs, practices, etc. Through these ISAs, the ruling class negotiates a societal acceptance of what is best only for them as if it were the best for everyone. Gramsci’s hegemony theory is more complex than Horkheimer’s and Adorno’s ideological education model of producer → consumer because he accounts for subversive action by the subordinated consumer. He describes how any subversion of the ruling class’s ideology could be reincorporated into the hegemonic order through a “terrain of exchange,” in which ISAs simulate a democratic relationship with the people, but channel disputes into safe places (i.e. not threatening to the hegemony); they also make safe concessions (Storey Intro 65) to further solidify the buy-in of the oppressed and ultimately their acceptance of the ruling hegemony. Louis Althusser explains more specifically how rulers gain the consent of the people: rather than proposing to them a system of relations, the ruling class educates people on how they should fit into the pre-existing system of relations (Althusser 340). He also explains that material practices, not just ideas, are imbued with values and ideologies (342). These distinctions help us talk more effectively about counter-hegemonic possibilities, because we can see how the consumer / subordinate class is generally not aware that power relations are constructs: instead of trying to change where and how we fit in a hegemonic order, an Althusserian perspective would have us change the system of relations that has been hidden in the education process. This perspective also helps us see material practices as changeable and shows material change as having meaningful impact on ideology itself. Punk subculture, theorizes Hebdige, is one place that breaks open the “naturalness” of society (“Subculture” 91). However, he notices a cycle of reincorporation or reabsorption (94): punk style and music get taken up by marketers and commodified. These commodities get sanitized (96-97): practices are frozen as images of practices, or they are trivialized or made exotic. Finally, they are imbued with mainstream values and ideology and recombined with societal norms. When what was once a subcultural expression (e.g. safety pins in clothing) becomes “normed” by mass production and marketing in mainstream clothing stores in mainstream ways (e.g. safety pins in a baby’s onesie from Sears), it loses the potential to jar expectations. We can see that punks are “normal” because they, too, have families and are capitalists—they are reabsorbed into mass culture, and this makes them and their subversions “safe.” Hebdige set up popular culture over and against subcultures, and this situates subcultures in a location that is always already a losing one (Hall “Rediscovery” 130, 147). Punk culture can only be successfully subversive on a local level with a relatively small number of individuals. The first model, in which the producer feeds the consumer ideology and the consumer gobbles it up wholesale, is a poor model. It does not account for the agency of the consumer, and it overestimates the power of the producer. It also falsely imbues the producers with an agency and a purposefulness, implying that they are teaching the ruling class’s ideology on purpose or systematically, which is not always the way ideology spreads. The second model tries to account for the consumer’s agency. It better illustrates the “terrain of exchange” principle, and shows that consumers modify as they consume and feed back their own pseudo-Frankenstein ideologies (or “folk culture”) to the producers. This model is still too simple, though, in that it gives primacy to the producer, or the ruling class, who always determines where it is safe to give ground to the consumer. Also, since consumers are individuals, it is impossible to guess how they might act: it’s possible that one will consume ideology wholesale, that another will reject it outright, and any course of action in between. So far these attempts resolve the hegemony problem either end with reabsorption into the mainstream, where they lose potency and change nothing; or they repudiate the mainstream, which also fails to change the hegemony that controls mass culture. Let’s examine a problematic assumption: why is pop culture always already theorized as being in the service of hegemonic power relations? The pop / sub culture dichotomy is a false and overly simplified one. Could popular music ever be a successful subversion of dominant ideology? It seems like a definitional impossibility, given that “popular” implies that the majority likes it and “dominant” that the majority does it. Yet if we accept the given terms of the argument, and then present an “alternative” or a sub-cultural subversion of some sort, it is already unsuccessful at redefining the norm precisely because it is constituted as alternative, as not norm-al. To really subvert the discussion, the ruling ideology, we must call into question the terms, the ground rules, the ruling logic. In Althusser’s terms, we should not renegotiate our place within existing power relations, but rather question the power relations themselves. But this is difficult to do unless you have access to the means of signification, the power to redefine. My goal in this thesis is to articulate a theory that is capable of creating change in the ideological moorings of mass culture. I believe that such a theory must be a complex one with lots of moving parts that must be “combined, dismantled, bricolaged” if it is to build “politically effective alliances” (Hebdige “Postmodernism” 422). Marxism has gone out of style, but I think that is largely because people have the idea that it’s all about economic determinism and simple, fixed binary models (like the producer → consumer or oppressor → oppressed models above). But some of the basic tenets, stripped of their telos and arbitrary structuration, create a solid foundation on which to build effective counter-hegemonic solutions. I have established the hegemony problem sufficiently for now, and the subsequent chapters will explore solutions. Now that I have established my theoretical position, I will conclude with a brief description of the remaining chapters showing how they are situated in the problematic of subverting hegemony. The second chapter explains my own modifications to construct a more flexible Marxism (Hall), one that incorporates a dynamic view of ideological formation and a complex understanding of relations among discourses. I discuss how commodities have agency and how they can be counter-hegemonic without succumbing to the appropriation cycle, given the right conditions. This functions as the analytical framework for analyzing the entire album. An analysis of the song “Bad” and the accompanying short film, based on this framework of the counter-hegemonic commodity, shows how the song’s main ideological function is to raise questions and destabilize. Language, sound, clothing, bodies, and dance all work to subvert social and cultural norms. The third chapter focuses on agency and identity in the songs “The Way You Make Me Feel,” “Speed Demon,” and “Liberian Girl.” In the first song, Jackson pursues a woman somewhat relentlessly in the video. The lyrics, though, still place him in a passive position. “Liberian Girl” is about practically the same thing lyrically, but the video shows him as a trickster. While we have been enjoying the media manipulations of him, he has been filming us, watching and planning the whole time. “Speed Demon” depicts a very fluid notion of identity that combats stereotypes. What emerges in this arc of Bad is a conflicting and confusing tug-of-war between hegemonic identity formation and alternative conceptions of identity. In the fourth chapter I take up the question of authorship in an analysis of “Just Good Friends,” “Another Part of Me,” and “Man in the Mirror.” This trio of songs begs this discussion because the first and third were not written by Michael Jackson, and the second can hardly be thought of as an independent text as it was part of the Captain EO film. “Just Good Friends” implicates Jackson as an advocate for a certain view of relationships and women, but it also portrays Jackson as comfortable with indeterminacy. “Man in the Mirror” includes an important shift in agency and responsibility for the world’s problems: it claims that we need to change our own ways (locating fault in us) rather than looking at institutional issues. Despite sounding like a utopian dream on its surface, this song is quite conservative in its message. Captain EO was made for and continues to be shown in Disneyland, a place that Jean Baudrillard discusses as a quintessential example of simulation and dissimulation. This film simultaneously portrays Utopia and Dystopia, colonial and post-colonial messages. The basic question underlying these songs is this: what versions of Michael Jackson are being put forth and by whom? And what cultural and ideological work are these simulacra doing? The fifth chapter looks at the polysemous character of the songs “I Just Can’t Stop Loving You,” “Dirty Diana,” and “Leave Me Alone.” These songs portray several specific iterations of the simulacra of Michael Jackson. They show us how the man with the body both fought against and reveled in these (un)authorized versions. Each song portrays Jackson’s relationship with a woman (as a metaphor for the media) differently, giving agency to the multiple parties in different amounts. In “I Just Can’t Stop Loving You,” the relationship is mutually beneficial but acknowledged as tenuous. In “Dirty Diana,” the media representations of Jackson ruin his personal life and career. In “Leave Me Alone,” he sings about wanting to be left alone, yet he is depicted in the music video enacting all the crazy things the media attributes to him. By the end of these three songs, we have multiple representations of Jackson in our minds, and it becomes impossible (and somewhat useless) to distinguish the real from the hyperreal. 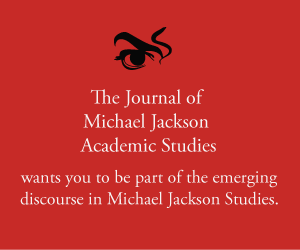 Chapter 6 focuses on Jackson’s body through an analysis of “Smooth Criminal.” Michael Jackson’s body and clothing break open our ideas of what constitutes a person, what people are supposed to do, how they are supposed to look, and more. He pushes the boundaries of what bodies are allowed and able to do through his dance, moonwalking and leaning in particular. We are forced to understand the words “smooth” and “criminal” in multiple senses. This is a richly ambiguous texts that refuses ossified significance, that opens up a proliferation of meaning with bodies performing contradictory, openly interpretable, and unexpected acts.